The millennial generation’s most celebrated literary achievement.”—Al-Ahram Weekly “The first glimmer of hope for a true fictional renaissance—an instantly rewarding read embraced by an unprecedented range of literary figures”—The Daily Star What is madness?” asks the narrator of Ahmed Alaidy’s jittery, funny, and angry novel. Assuring readers that they are about to find out, the narrator takes us on a journey through the insanity of present-day Cairo—in and out of minibuses, malls, and crash pads, navigating the city’s pinball machine of social life with tolerable efficiency. But lurking under the rocks in his grouchy, chain-smoking, pharmaceutically-oriented, twenty-something life are characters like his elusive psychiatrist uncle with a disturbing interest in phobias. And then there’s Abbas, the narrator’s best friend who surfaces at critical moments to drive our hero into uncontrollably multiplying difficulties. For instance, there’s the ticklish situation with the simultaneous blind-dates Abbas has set up for him on different levels of a coffee-shop in a Cairo mall with two girls both called Hind. With friends like Abbas, what paranoiac needs enemies? AHMED ALAIDY, born in 1974, has written satirical stories for young people and currently writes a political comic strip for an Egyptian weekly. HUMPHREY DAVIES is the translator of The Yacoubian Building by Alaa Al Aswany (AUC Press, 2004). 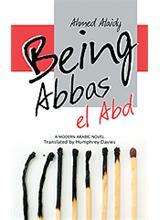 Request: Being Abbas el Abd.